Now into it's 15th year, the London City Fun Day and Air Show is an annual community event for people of East London. All proceeds from the day go to help the Richard House Children’s Hospice, which provides care to hundreds of life limited and life threatened children and their families living in the London area. 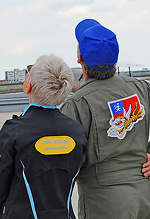 Last year's event raised £25,000, and a major part of the Fun Day is the air display at London City Airport. Richard Foord guest reports for UKAR from London City Airport. All photos by the author. Staging an airshow at a busy and active airport has it's challenges, and with the field remaining fully operational until one hour before the show begins, there's just a small window of 30 minutes for all participating pilots to get their aircraft in and parked, ready to attend the briefing. Similarly at the close of the show there is an equally tight window for all departures so that the airport can resume normal service. These tight time constraints means that the organisation has to be slick and well disciplined, and as it turned out, everything ran like clockwork. You could describe the Air Show as a bit of a "pocket rocket", with a fantastic selection of items on the programme providing the audience with a dynamic display and continuous entertainment. 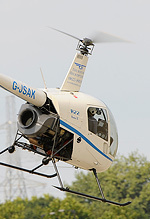 Naturally, being staged at an inner-city airport, the backdrop is somewhat different to the norm with aircraft arriving and displaying having to contend with water, high buildings, pylons and cranes. From a photographic view this provided a challenge, but equally it occurred to me that I could use this cluttered backdrop to my advantage; small aircraft against BA airliners, a Spitfire and Mustang approaching over pylons and cranes... it's all quite unusual. The show opened with Tony Richards flying the Stearman, a display I paid particularly close attention to as my wife Romey was his Wingwalker on the rig! Romey is a pilot herself and had the unique experience of flying into London City in a Robin DR400 before popping up on the Rig to lift the curtain on the 2011 display as part of the barnstorming display. She was in safe hands though, as Tony is CFI at the Tiger Club down at Headcorn and a very experienced display pilot to boot. Next up was Pete Kynsey, a multi-talented pilot more often than not seen flying warbirds for the Duxford based Fighter Collection, who was on this occasion operating the controls of the Cosmic Wind in a display of very fast and very precise manoeuvres we've come to expect from this distinctive aircraft. The mood of the show changed from fast exciting flying to elegant formations when Bob Grimstead and Matthew Hill performed in the Fourniers, fitted with orange smoke wing tip canisters. 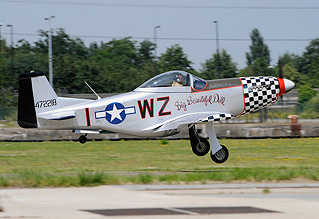 Grey skies then moved in to replace the earlier blue, but conditions were still crystal clear to see Dave Stephens in his home built, small scale replica of P-51 "Big Beautiful Doll" - the full size counterpart having since made the headlines at Duxford's Flying Legends airshow. Based at Damyns Hall in Essex, Dave's passion for flying extends to building very interesting aircraft which he then displays beautifully. Young Michael Pickin took to the skies in the Bucker Jungmann and within seconds was performing a stunning aerobatic sequence to the delight of the crowd assembled on the Dockside. Christian Moullec performed a display like no other with his trademark Geese flying in formation - an unbelievable performance and particularly well received by those gathered for the display. As he and his feathered friends landed, Paul Bonhomme arrived in the Old Flying Machine Company's P-51D "Ferocious Frankie", hurtling across the sky from right to left giving us all the best from the Packard Merlin engine and making the gun ports "sing" in steep dives. Airline captain Paul Ambrose gave a very well executed performance in his beautiful gleaming dark blue Pitts. Next up was something else out of the ordinary - stunt man Julian Spencer in the Robinson R22 helicopter, whose skillful display shows you how versatile a helicopter can be. Don't try this at home! British Aerobatic team member Richard Pickin made a smart departure from the runway in his Cap 232, which developed into a steep, fast climb before entering from the right, trailing smoke, to give a spectacular and breathtaking aerobatic performance. This was followed smartly by Alister Kay and Andy Hill, also known as the RV-8TORS. Smoke-on formation flying to perfection, the aircraft colour schemes showing up well against the dark cloud formations. It was left to the OFMC, and Steve Jones in particular, to close the flying display, bringing Spitfire MkIX MH434 in from Duxford. A magnificent routine followed, poignient too over the skies of London. In summary, this was an excellent event; extremely well organised with a good variety of acts and a fast moving display in an unusual setting, which made for a spectacular airshow. Well done to the pilots and organisers and a special thanks to John Nolan for a very spirited and informed airshow commentary.